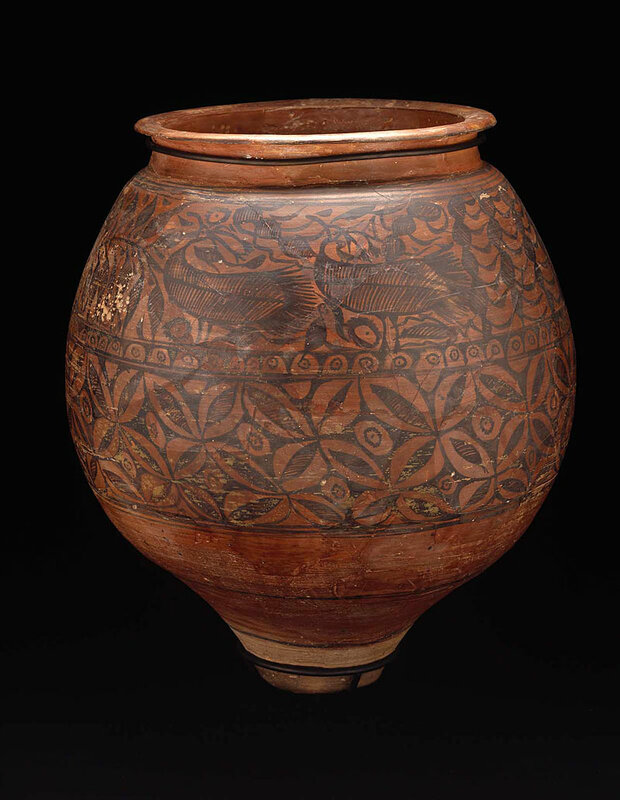 One of the finest ancient Indus painted jars ever found, excavated at Chanhu-daro during the 1935-36 season led by Ernest MacKay, who wrote that "a circle motif takes a prominent place, and in vessels of this kind, about half the painted area is usually occupied by this pattern. No other decoration as a rule is placed below it, but a wide register above it is generally reserved for other forms of decoration." He added: "In present-day Sindh it is the men who make and the women who paint the pottery, and we shall not be far wrong in thinking that the credit for the decorating at Chanhu-daro and allied wares should be given to the women." (Mackay, Chanhudaro Excavations 1935-36, pp. 94, 102). Mark Kenoyer describes it as a "large storage jar with red slip and black painted motifs, including peacocks, vegetation and the famous intersecting-circle design. Such vessels were probably used as marriage gifts or for other ritual occasions, and the motifs undoubtedly represent auspicious blessings on the owner" (Ancient Cities of the Indus Civilization, p. 231).